So know what you mean about rheumatology waiting rooms! Makes me feel so young!! Its interesting to hear about your experiences. I am also quite badly Vit D deficient….seems to be very common amongst people with rheumatoid. I hope you have some nice weather where you live soon so you can enjoy some rays of sunshine! I hope your arm is ok, looks very sore bless you. Do you take a supplement for Vitamin D? Surprisingly it is supposed to warm up, with thunderstorms. How are you feeling? Any recent appt’s? 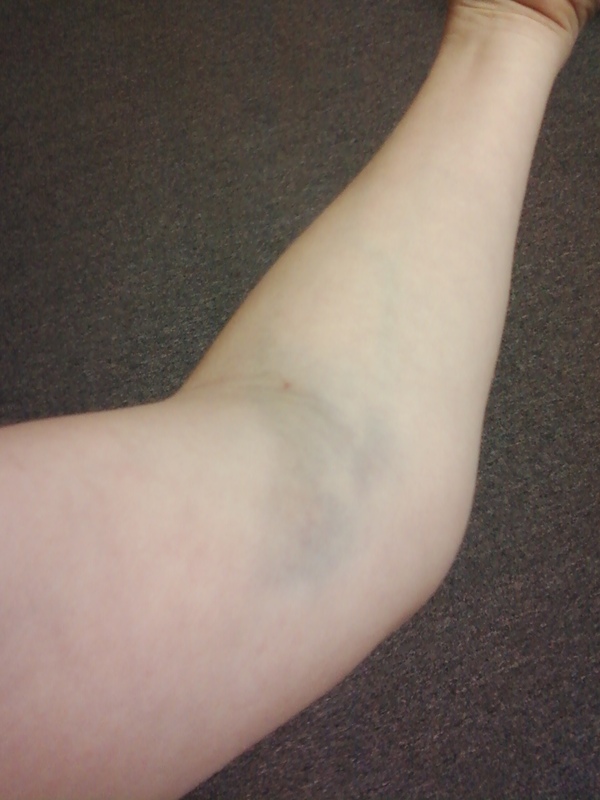 My arm is still bruised, but it’s healing thank goodness. Becca – I am so sorry for not replying to your comment sooner, I have been meaning to for ages!! Yes, I take a high dose Vit D and calcium supplement twice daily. I plan on asking my rheumatologist how much affect it has had when I next visit as Ive been on it a good 5/6 months now. I have definitely noticed that I get less muscle spasams because of it – are you planning on taking anything? Im ok thank you. Unfortunately, Im still not healed from my back surgery so not back on the meds yet 😦 I am hoping I will be back on them in 2 months or so as my arthritis isnt good at the moment. I am sure I will get there eventually! Thank you for your support and I hope your arm has healed! No problem 🙂 I just recently started taking Vit. D and am hoping to be able to tell a difference within a few weeks. I had no clue you had back surgery, I’m so sorry! Here’s to a SPEEDY recovery! Yikes, you must be in a flare up! I appreciate your support also!